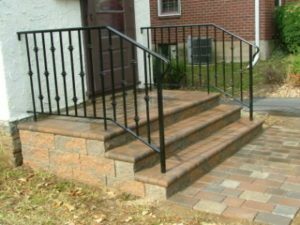 Designing and constructing steps & landings out of brick, flagstone and segmental retaining wall stones in Delaware County, Philadelphia, Chester County, Montgomery County, and the Main Line, PA. We can construct steps and landings with many different materials. The height and length of the change in elevation is measured to determine the number of steps, the height of each riser, and the length of each tread. 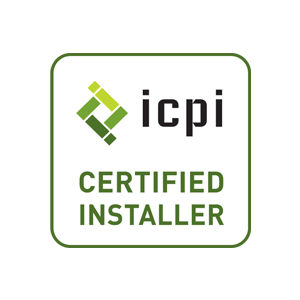 Before construction existing levels are checked, and the level for the steps or landing is determined. The height and length of the change in elevation is measured to determine the number of steps, the height of each riser, and the width of each tread. Attention has to be paid to level of the floor inside house, and the elevation of the threshold. Often the house itself is used as the top step into the house. 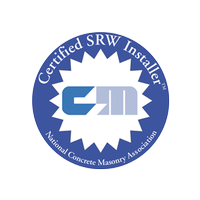 This helps keep snow and rain away from the threshold and can cut down on the expense of the job. 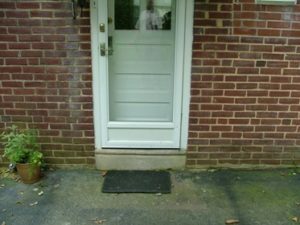 It is usually more comfortable entering and exiting the house if the top step, or landing at the top, is at least 18-inches wide. A call is made to PA One Call to determine if there are underground utilities in the excavation area. 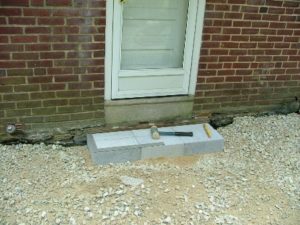 This page is here to illustrate how we construct our steps, and should not be used as a how to guide for step construction. 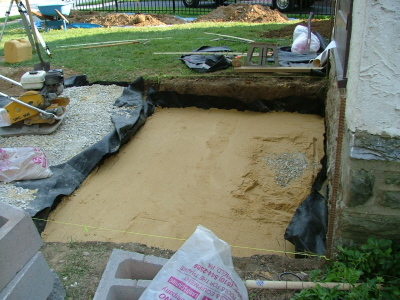 Many variables can affect how steps perform such as improper compaction against the foundation of new construction, soil type, depth of excavation, subsoil compaction, use of stabilization fabric, depth and compaction of modified stone base, and depth of bedding sand. 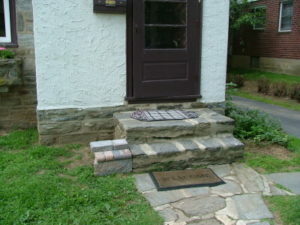 Steps shown were constructed by Robert J. Kleinberg Landscape Design and Construction. 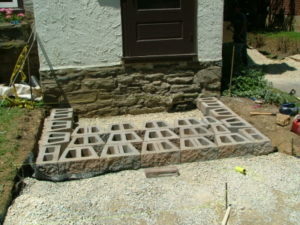 Existing steps are removed, soil is excavated to allow for at least 6-inches of modified stone for the base, and at least 8-inches of buried wall stone. Laser level is used to determine elevations for the steps and the excavation. For new construction (less than 10 years old) E.P. 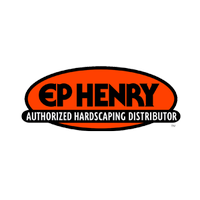 Henry recommends overdig stabilization to ensure proper compaction against the foundation of the house. 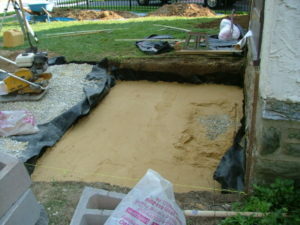 (Improper compaction against the foundation is common in new construction). 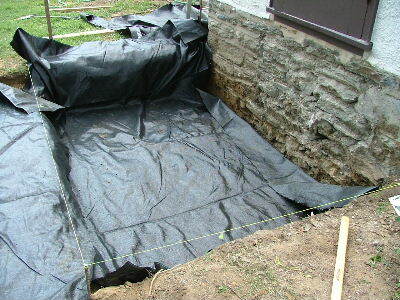 Stabilization fabric is installed over the subsoil. Modified stone 6-inches deep is installed in two layers and each layer is compacted. Notice laser level receiver and rod on the right side used to determine level. 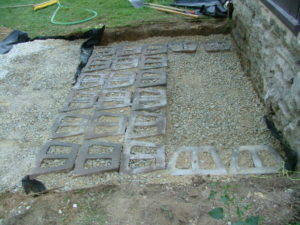 One inch of coarse sand is spread level for the setting bed used to help level the wall stones. 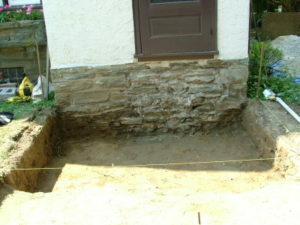 At Least one layer of wall stones is set below grade. Wall stones are filled with clean stone. 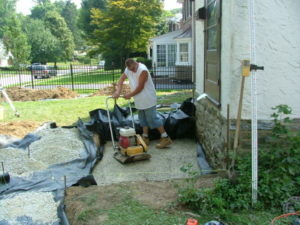 For larger landings the area is filled with modified stone in 3-inch lifts and compacted. 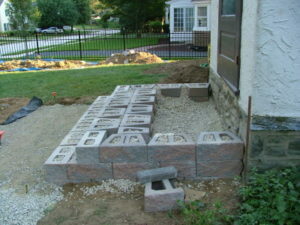 Smaller landings are built up solid with wall stones. 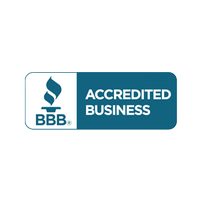 Notice the third step goes solid all the way down to the base. Finish wall stones and start to install caps with retaining wall adhesive (bullnose pavers on this job). 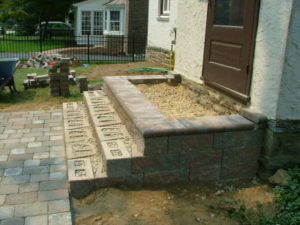 Corners are mitered here to bring bullnose edge to all sides of the steps. 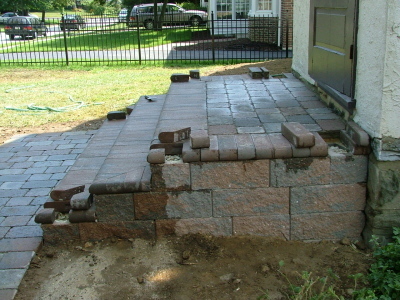 Pavers are installed in the top landing with a little crown to allow for drainage. 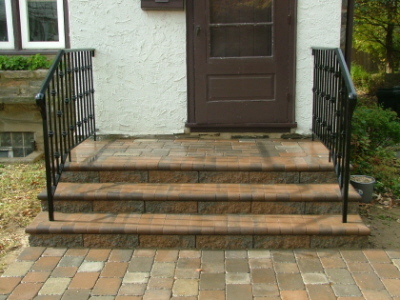 Adhesive is not used on a few bullnose pavers in the corners yet to make installation of the railing a little easier. (Railing installed by DeVito Brothers & Son of Ardmore, PA) After railing is installed the remaining bullnose pavers are cut around the railing and installed. Solid Flagstone, Bluestone, and Solid Stone Blocks 6-in. thick can be installed as complete steps. 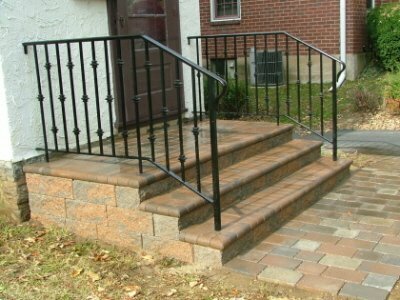 These treads were installed with the same technique as Segmental Retaining wall steps. A 6-in. modified stone base was installed and compacted for each tread and 6-in. solid cinder blocks were installed below grade on this base. 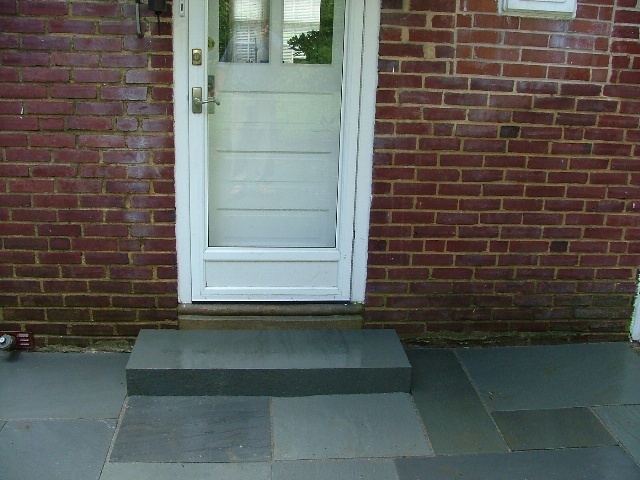 Flagstone / Bluestone treads 6-in. thick were installed on the blocks with retaining wall adhesive.